First time posting after an absence of a couple of years. I need some advice on a set of manual carving tools, and on a suitable die grinder. On the latter, I've done a fair amount of searching on the forum, and gather that Makita is very popular. Can anyone suggest which would be better: GDO 601, GDO 800c? The 800c has variable speed, but seems a bit bulky--I'm not sure. I've gotten some good info on bits/cutters. As for manual carvers, can anyone suggest a good set? I'd prefer to buy good tools that will last; I'm not interested in throwing money to the wind, but I don't want to buy twice either. Just to give you a sense of my material: I've got a few trees grown from cuttings: a couple of olives with 5-inch bases that have been potted up and cut back, a couple of junipers, and a few more trees in various stages of development. You can buy hand tools from me. Details on PM or mail. I think the best die grinder is the Bosch 1215. I've owned one for about 25 years and put 100's of hours on it with no trouble. Still has the original motor brushes. You will need 1/4 inch shank carbide burrs. These are made for metel work, but also work well to sculpt hardwood. For rough carving, a 1/4 inch shank corebox bit will do well. A tool store that sells router bits will be able to supply this. If you go this route, be careful! 2 hands on the machine, one close to the rotating end. One of the features of the Bosch is a smooth rotating hub near the collet that will gently remind you that you're too close to the tool. 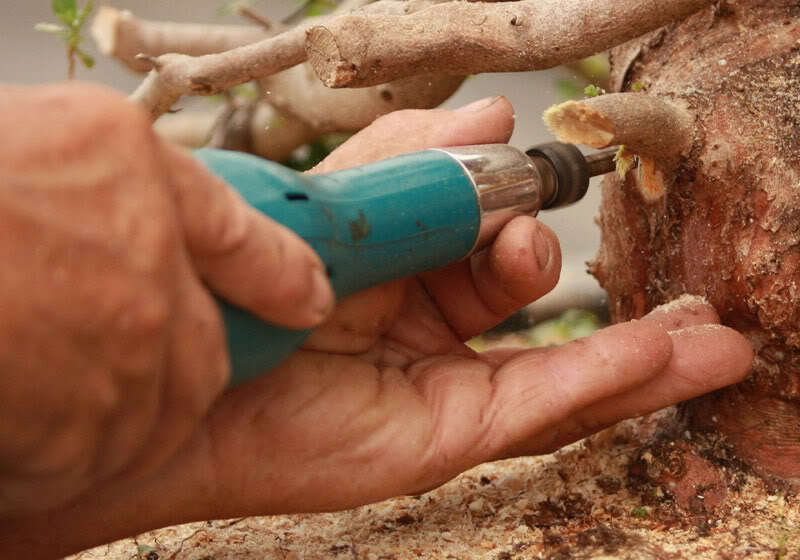 For bonsai hand tools, check this link. Have fun and post some of your work! PS. Don't waste money on a variable speed die grinder. People I know that have, that's the first thing to go wrong. If you need slower speed, buy a variable speed box that plugs into the outlet, and the die grinder plugs into the box. The box has variable control from 0 to full speed. Mario Stefano wrote: You can buy hand tools from me. Details on PM or mail. Thanks very much for all the advice--very helpful. And yes I'll post some photos (as well as asking for advice about styling). Thanks again, and if anyone has more ideas, I'm all ears (or eyes, in this case). Frankly... I am more than a little turned off by how Makita changed their GE0600. So I'm going to give you the only non-ebay source for them left in the US. I've bought 3 from her which gives me a total of 4... I'll likely pick up a few more before she runs out. Mostly because I want enough to have them available for teaching at some point. All die grinders are not created equal... and while people have very particular reasons for loving the one's they do, this one is the classic... and it's also a long lasting tool. But the big thing for me is the weight... the Bosch weighs 3.2 lbs... Dewalt weighs 3.25... the new Makita weighs 3.5... and the old one weighs 2.0 lbs... that makes a big difference when you are carving for hours on a large tree. I also found this listing today for them... about the same price with shipping. As I recall... the purchase price at icecrafter's also included shipping, so it's about the same both ways... about $150. I also purchase Ninja Master and Shogun Master bits through Dale Cohocy who is also on this site. I get most of my special bits from him, and my corebox router bits locally. Funny you should mention this. The more I looked at the new Makitas online, the less I liked them: they're bigger, and they have a fat collar exactly where you don't want it for carving--at least when you need to get in tight places. So I found a seller on Ebay who had the GEO600 and ordered one this a.m.--dennylumber or something. So, it's on its way. The Bosch 1215 which was also recommended looked great, but I didn't want to drop $250 on one. I'll check out the bits you mentioned. Thanks again! Always (whenever possible, which is most of the time) maintain contact with the tree you are carving. 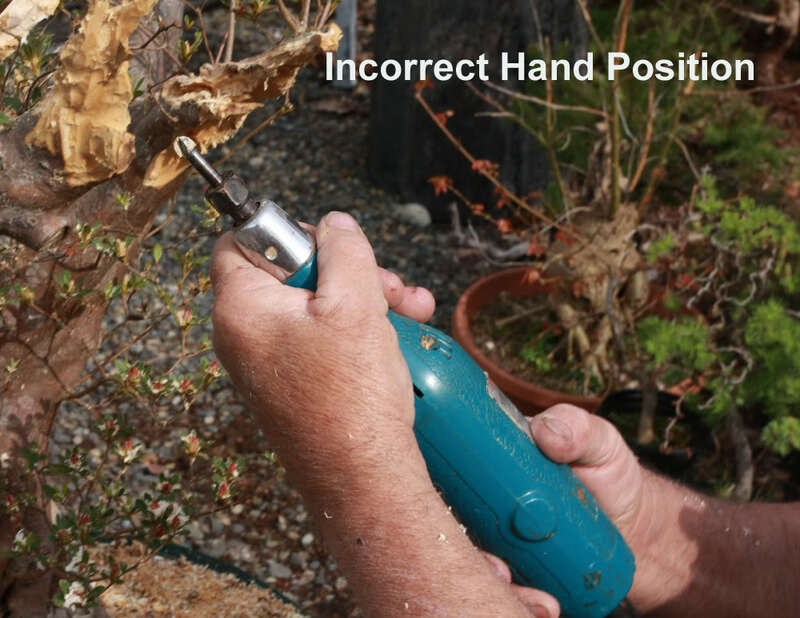 Notice how Daniel maintains contact with the tree with the same hand which guides the tool... it increases your control greatly. I teach sculpture at a university which includes teaching wood carving and woodshop and tool safety to the students. For liability reasons only instructors and technicians can teach technical and tool safety to the students. This is because some students may come with prior experience with these tools but this knowledge might have been through an unsafe source and their behavior could be passed on to others. All tools, machinery, and the different makes and models perform and handle differently and this is also a concern. 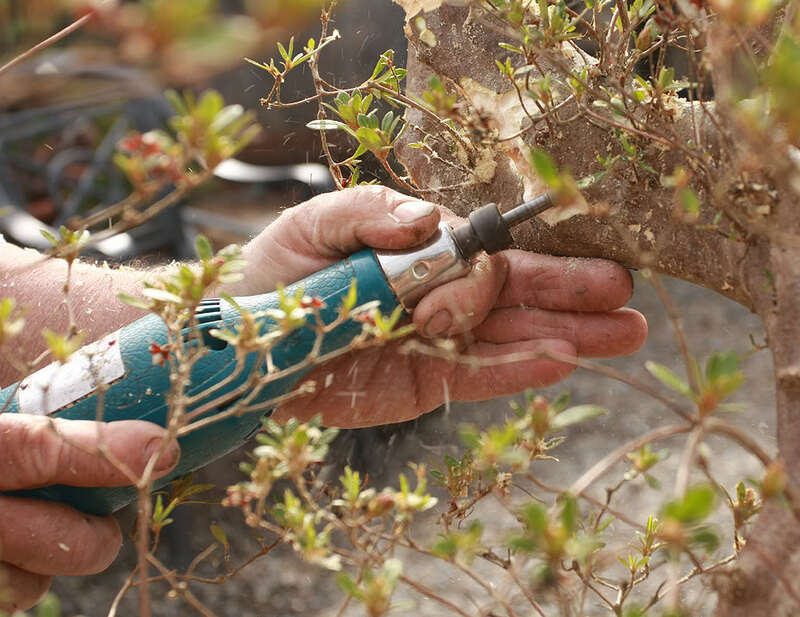 Just because Makita seem to be frequently used to carve bonsai doesn't mean that they are the best tool for the job, but just perhaps the most widely available. Safety should always be the first concern and not the speed at which you can remove the wood from your trees. Die Grinders have not been designed to carve wood but to grind metal which is for the most part a consistent density unlike wood which can have knots, hard and soft areas, shifts in grain direction, stones and dirt. Often they run at very high speeds for the wood carving bits and if they grab the wood they can kickback and skip across the surface of the wood or areas to don't want carved or even worst on to your hand. I understand Victrinia is trying to be helpful and not that Dan isn't an expert at carving and still appears to have all his fingers, but he might have just been lucky or happen to have enough respect for the tools not to over work them and get into a situation where it might kick back. The Makita is a large and powerful die grinder and should be used with BOTH HANDS FIRMLY ON THE TOOL and not as pictured, CHECK THE SAFETY MANUAL and don’t rely only on what might work for others. If the carving bit did grab or kick back and your fingers were in front or beside the cutting bit resting on the trunk they might be seriously cut. These tools also vibrate quite a bit and if your hands are only loosely holding the tool it could be just enough to allow the grinder to slip if your hand becomes tired or numb from the vibration. The biggest issue I have which the photos is that Dan IS NOT WEARING SAFETY GLASSES or better yet a full face shield, and we often forget about our lungs, wood dust is a known carcinogen, and those areas of rotten wood can put dangerous molds into your lungs. Another factor is of course the size of your trees or the area you want to carve and a tool like the Makita might be overkill if you have smaller trees. I have used a Makita and did not like it (but obviously others do). I use a Foredom with a flexshaft. This tool is powerful, has variable speeds through a foot controller, with the flex shaft it can get into almost any area and can be use for a variety of jobs on a lot of different materials. They are more expensive but would have a higher resale value and more importantly they are safer to use to carve wood with. I would also check out Arbortec mini carver and power chisel, I've used both and they are great. I would also look into air die grinders if you have or need an air compressor since most air tools are controlled through the air pressure which allows you to control the speed of your tool. Buy safety glasses and a good respirator. Can I add, working wood at the appropriate stage with the right tool, makes work easier and safer. In most cases, I bulk carve wood in the green. I only use the Makita and large cutters at this stage and the wood will carve very easily and relatively safely. Wood is allowed to harden before smaller more detailed refining work is carried out with a dremmel. Obviously some deadwood is old when it needs carving and this is where the potential danger lies. Never force or push your makita into the work. Let the cutters go into the wood at their own pace. Take frequent breaks as well. This gives the tool a chance to cool, your arms a rest and a chance to evaluate your work. I second all that grafton toad and Will have said. Having nearly been hit by a bit that sheared off at maximum rev's, safety is now paramount. The control aspect that Victrinia shows can still be achieved, more safely, by resting the knuckles of one hand that is grasping the body of the tool against the wood well AWAY from the bit. Also remember that some wood that is commonly carved contains toxins ie all Taxus or Yew. I like the turntable. Is it sold in the United States? Going back to the point of safety and the pictures kindly supplied by Victrinia, the router bit used is not designed to be used this way. I have tried them with the view to cutting costs but found them extremely jumpy and dangerous. There are cutters on the market designed specifically for our type of work and are very smooth to use. I agree with the issue about goggles... I use them personally along with face masks as often as not. Dan doesn't because he just doesn't. Also... the knuckles approch still maintains contact with the tree... which is what he was doing in the first photo. But I've done both methods for years... and he's done it for decades... and I can say from my personal experiance that not maintaining contact with the tree causes more potential risks than it prevents. So however you manage to do it... that's groovy. Core box router bits are a very effective bit for many purposes... they tend to be Dan's bit of choice because they never clog. I like the Shogun Master, and Ninja Master as well... because of the clean cuts... but their heads are considerably wider, so they have limitations as well... It's a lot of personal preference along with being attentive to your work so that you are safe. The warnings are helpful. As it happens, my first memorable injury came at the age of seven when my finger made contact with the business end of grinding wheel on a floorstander in my dad's machine shop. Some forty years later, the 1/2 inch scar remains. Anyway, I've been around tools--dangerous or not--most of my life, but had probably underestimated the dangers of working on bonsai w/ a die grinder. I use rotary tools for daiza carving (suiseki) & carving green wood (bonsai). The Foredom with flexible shaft is very versatile with both variable speed & reverse spin. The reverse spin is especially useful in daiza carving to cut with-the-grain on both sides. You must have light-in-weight tools for daiza carving. My favorite daiza carver is an ancient single speed Dremel clone because it weighs so little, but it also heats quickly & has too much speed relative to power except for exceptionally small carving bits. On serious bits, I'd highly recommend the Foredom Typhoon series-- the red-color coarse grain for both bonsai & daiza carving. The tungsten carbide cutting teeth are aligned so that even green wood seldom sticks. It is a huge advantage to not expend effort on burning or brushing wood out of your carving bits. The coarse bit running with-the-grain for dried lumber leaves a surprisingly smooth surface for daiza carving while quickly eating wood. For daiza carving, I'd choose a large flat-head cylinder bit & a large round head cylinder bit as the 1/4" shaft preference. 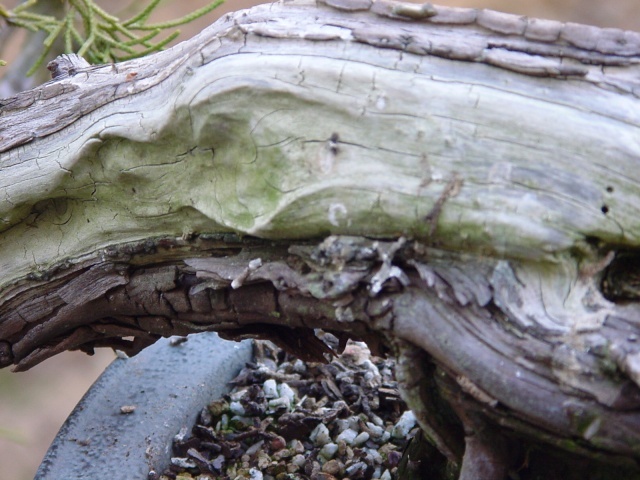 For bonsai trunk carving, I learned from having access to innumerable tools at Dan Barton's residential course that a large wheel edge exposed on its outside surface allows MANY varieties of cuts. Re' safety, you cannot be too careful. Dust from exotic oily hardwoods used for daiza are especially dangerous. I like hand carving at final stages of daiza production-- push tools finely honed rather that gouges & chisels for tapping. I've borrowed a reciprocating carver (chisel or gouge end) and found it exceptionally nice for carving a shallow flat daiza bottom. It closely emulates handcarving but with ease and speed over larger surface areas. Rotating bits are faster for deep wood removal. Another safety hint. Be very certain that the rotating tool you put in the die grinder collet is rated for the speed of the grinder. Many times over the years I've seen a slow speed tool being used in the die grinder. One example I well remember was at a GSBF convention years ago. The headliner was using a slow speed tool at full speed. I was in the audience and could tell from the sound and the amount of vibration that the tool was rated for drill speed. Probably not rated for more than 5000 rpm. I told the moderator and she passed the word to the domonstrators, but it did no good. They continued on, but luckily no harm came. One way to tell the tool diameter is too large is excessive vibration. If this occurs, use a speed control to slow down the machine, or use a smaller bit. Don't risk damage to yourself or the machine. One of the worst examples of a tool being sold for use in the die grinder is the Samurai. I bought one, and the moment I turned on the grinder I knew it was wrong. I think the absolute top speed rating for the Samuari should be 14-15 thousand rpm. I bought a large Milwaukee die grinder rated at 15k and the Samurai worked perfectly. Most of the standard size die grinders run in the 25k-30k range. At 30k, the largest diameter tool would be in the 3/4 inch range. Larger than that you may want to consider a speed control. So, the last word is be careful and be happy! PS. Looking through some old records, in 1987 I bought a Makita die grinder for $52. I agree with Grafton, Will and Kevin and others. Never put your hands anywhere near the blade, always wear eye protection and consider ear plugs and dust masks also. Anyone teaching carving and not doing this is frankly unsafe and wrong. The core box bit is designed to be used in a router that moves along a fence or in a router table. Using one free hand is risky due to the reasons of kick back. Some router bits have antikick back mechanisms in them but not a core box bit. Aggressive carbide burrs would be a much better and safer (albiet more expensive and slower) choice. Another key carving point is to carve with the grain where ever possible (using power or hand tools). Carving little wiggles that go across the grain does not look very convincing especially as wood drives out and splits along the grain. The cross grain work will reveal the hand of a human. Usue progressively smaller bits to vary the channel sizes to again appear more natural. Finaly finish any carved section with hand tools to emphasize the grain. I totally respect the opinions offered. I also respectfully offer that we may have to agree to disagree on the notion of Daniel's method being somehow unacceptable. With a track record of zero injuries, it leaves room for argument. Victrinia Ridgeway wrote: I totally respect the opinions offered. I also respectfully offer that we may have to agree to disagree on the notion of Daniel's method being somehow unacceptable. With a track record of zero injuries, it leaves room for argument. You are right, we will disagree on this. The logic approach "that track record of zero injuries" is the wrong logic from a safety point of view. It was the same logic that NASA appiled to the O ring problem on the space shuttle solid boosters. They knew it was a problem and they ignored it because it never caused a problem on 70 shuttle launches until Challenger blew up. In this case, the tool manufacturers have thousand of users and many injuries in their database. In essense that technique is an accident waiting to happen. 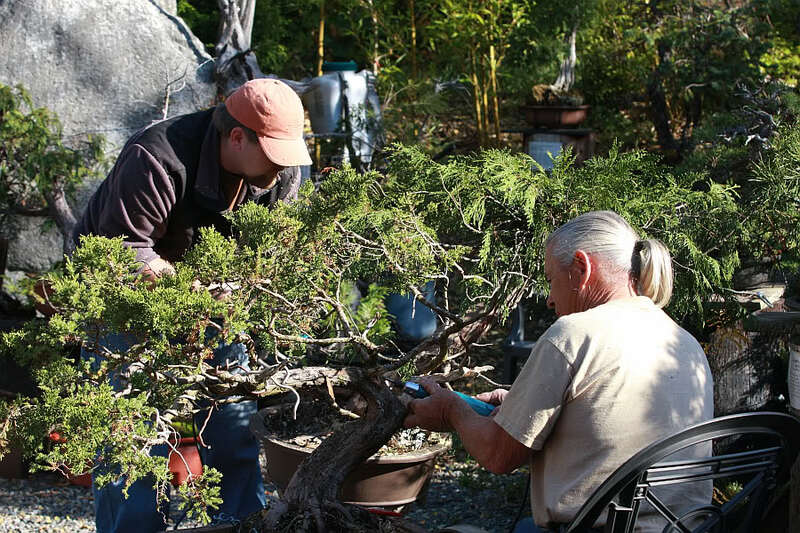 A famous American bonsai artist noted for his carving needed many stiches as a result of a demo accident for putting his hand closed to a carving bit - luckily he didn't lose use of his hand. A person may get lucky but statistically speaking, teaching other people to do it that way is inviting greater chance of injury. I wouldn't do it and I would encourage others not to do it. Especially when there are safer alternatives. Control in carving comes from going with the grain, using the right tool for the job and having very sharp tools. Another thought on the safety note is ear plugs. Although it is seemingly not an immediate danger the use of high rpm tools over extended periods of time can have serious effects on your hearing. My friend's father was a carpenter and wood worker for most of his life and by the age of 55 had lost nearly 60% of his hearing from the use of high speed saws and carving tools. Also my father in-law was a dentist his whole life an he lost nearly 80% of hearing ability from drilling teeth. He could barely hear with a hearing aid. Anyway I just thought I would add another two cents to the conversation. Keep yours ears safe too. I do hope no one will mind if I have nothing further to add to any additional comments that may arise in this conversation. I don't wish to appear as flippant, but I think people will have gotten the point that I offered the methodology that I had been taught, and that several individuals of better reputation than mine in this place have questioned it. So rather than repeating myself, with any other dissenting views, I shall leave well enough alone, and let the reader decide what they will and will not dare. Thanks to all for the opportunity to engage in respectful disagreement. While there is no doubt in my heart that I am in the minority of opinion on this subject, it has not been personal, which is a wonderful change of pace from other sites where name calling or slurs seems to be the preferred tool for making an argument.